The long handscroll depicts a variety of activities on a spring morning in the imperial palace of Han Dynasty (202 BC – AD 220. Hangong Chunxiao Tu or Spring Morning in the Han Palace has long been cherished by Chinese art lovers as one the top 10 masterpieces in traditional Chinese painting. The 30.6 x 574.1 centimeter, ink and color on silk handscroll was painted in the 16th century by Qiu Ying (1494-1552), a prominent painter in Ming Dynasty (1368-1644). Qiu was born into a peasant’s family in Taicang in today’s Jiangsu Province in east China and his family was later moved to Suzhou, a scenic city in the same province. In his early youth, Qiu worked as a lacquerer who painted columns and beams of rich people’s houses. But later, he gained a reputation after his works were praised by Wen Zhengming (1470-1559), a renowned painter and calligrapher. His talent was also appreciated by another professional painter Zhou Chen (1460-1535), who later became Qiu’s art teacher. Under Zhou’s tutorship, the young painter copied many masterpiece artworks of the Song Dynasty (960-1279) in order to learn the painting skills of that time. Some of his copies, such as the famous Along the River During the Qingming Festival, were so convincing that even many art specialists could hardly discriminate them from the originals. Qiu later became a versatile painter and developed a number of fabulous painting skills in ink wash, line drawing and fine brush painting. The subjects of his paintings range from figures, birds, flowers, buildings and landscapes. However, he was best known for belle painting and ruler-lined painting, which refers to the traditional Chinese painting of architectural subjects, such as buildings, boats, wheeled vehicles, and other mechanical apparatuses with the aid of various rulers. Qiu’s masterpiece Spring Morning in the Han Palace is a perfect combination of the two. If you are reading on a mobile gadget, turn horizontal and enjoy the painting. “Spring Morning in the Han Palace” depicts a variety of activities on a spring morning in the imperial palace of Han Dynasty (202 BC – AD 220). There are altogether 115 figures, including court ladies, maids, eunuchs, painters and children. The long handscroll depicts a variety of activities on a spring morning in the imperial palace of Han Dynasty (202 BC – AD 220), though some of the objects and textile patterns apparently belonged to the painter’s own time. In the painting, there are altogether 115 figures, including court ladies, maids, eunuchs, painters and children. In an idyllic atmosphere, some of them are unhurriedly sweeping the yards, watering flowers or carrying things about, others are playing Chinese musical instruments, appreciating paintings, playing chess, reading books, chasing a butterfly or dancing and chatting. One of the major scenes in the painting portrays a group of court ladies and maids watching an imperial palace artist paint the portrait of another court lady, which was common practice during that time as emperors usually depended upon portraits to pick the court ladies. So, the ladies always bribed the artists to paint them prettier than they really were. The above scene portrays a group of court ladies and maids watching an imperial palace artist paint the portrait of another court lady. This scene reminds many viewers of the story about a beauty in the Han palace who refused to bribe her portraitist. As a result, the artist painted her less pretty than other court ladies, thus denying her the opportunity to meet the emperor. Later, when the emperor gave the beauty away to a chieftain from a northern nomad tribe as his wife, he found out that she was the most beautiful woman he had ever seen. In a flash of rage, the emperor ordered the immediate execution of the portrait painter. From right to left, the usual way of appreciating almost all traditional Chinese handscroll paintings, one will find that scenes in this artwork are very well arranged in an intricate and rather sophisticated composition. The brush works here are crisp and refined and the colors are bright and elegant. 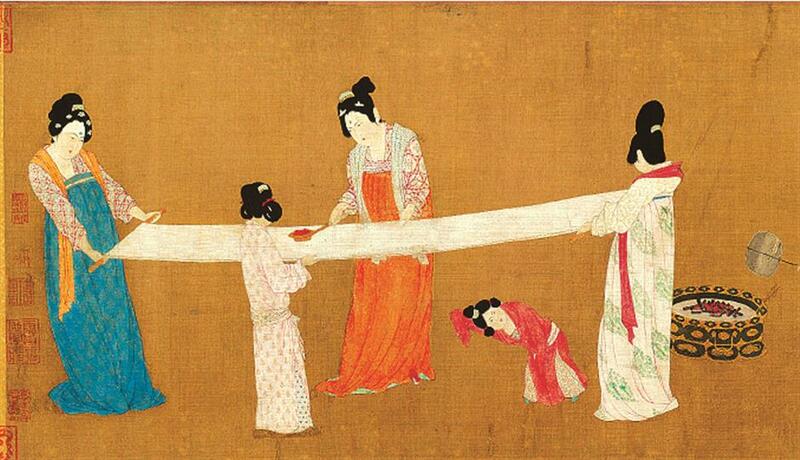 Qiu copied many masterpieces of the Song Dynasty in order to learn the painting skills. The part of the painting (top) resembles of Emperor Huizong’s “Court Ladies Preparing Newly Woven Silk (above),” which is an example of how his work was rooted in those masterpieces. Qiu’s court ladies and maids in this painting are so well portrayed that the artwork soon became a paradigm of belle painting or traditional Chinese painting of beautiful women for Chinese artists in the following centuries. Dozens of Qiu’s artworks survived the centuries, and Spring Morning in the Han Palace is now housed at the National Palace Museum in Taipei.